In the latter half of the 19th century, widespread disagreement over player payments led to a great schism in British rugby football. Those who believed the sport should retain a wholly amateur status remained with the Rugby Football Union, while those who felt clubs should have the option to pay their players founded the Northern Rugby Football Union. Thus, a new sport came into being. The NRFU introduced professionalism and changed a number of rules with the aim of creating faster, more exciting gameplay. Australia followed suit in 1907 with the foundation of the New South Wales Rugby Football League, which soon overtook union as the premier football code in the powerhouse eastern states of NSW and Queensland. Nowadays, league football is widely played in Australia, New Zealand, England, France and the Pacific islands. The best online bookmakers run betting markets for high-profile competitions all over the world, including major representative tournaments such as the Rugby League World Cup and the Australian State of Origin series. There is no shortage of rugby league bookies on the interwebs. No matter where you are in the world, you can wager on hundreds of match markets and league futures without having to set foot in a casino, a sports bar, or a high-street betting shop. However, we must stress that not all online bookies adhere to the same codes of practice. Whereas many are licensed, regulated and completely safe, others cut corners and have no regard for essentials such as online security or customer service. At BettingPlanet.com, we want to ensure our readers only frequent safe bookie sites that offer competitive odds and outstanding customer service. Our approved operators are all licensed by recognised gambling regulators and support a number of secure online payment methods for your local currency. Check out the links above to sign up and claim your exclusive welcome bonus. 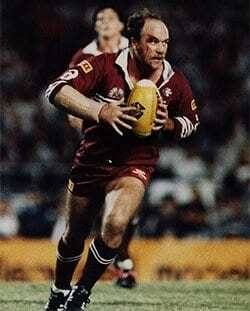 Queensland legend Wally Lewis, after whom the State of Origin player of the series award is named. State of Origin – Ask anyone from New South Wales or Queensland about the greatest rivalries in sport, and they will tell you nothing comes close to the annual State of Origin series. Each year, the NRL’s best and brightest talents split into two factions depending on where they began their rugby league careers. Those from NSW play for the Blues, while those who cut their teeth north of the border wear the Maroons jersey. A fiercer, more spiteful contest you will not see anywhere in the world, and Aussie punters go mad for it. National Rugby League – Formed in 1998 after Rupert Murdoch’s Super League war threatened to tear the game apart, the NRL is the highest level of domestic play in the Southern Hemisphere. It features 16 teams – 15 from Australia, one from NZ – that compete in a league-and-knockout system each year for a spot in the National Rugby League Grand Final. The NRL betting scene is extremely diverse and comes with a broad range of special futures markets, especially for prestigious individual accolades such as the Dally M and Clive Churchill medals. Super League Rugby – The European Super League, as it is often called abroad, is the top competition in the United Kingdom and Europe. Besides the traditional powerhouse clubs from the north of England, it has also welcomed teams from London, Paris and southern France. As it is the top flight of a multi-tier league system where teams are promoted and relegated at the end of each season, Super League betting offers certain types of outright markets that are not available in closed-league competitions such as the NRL. Rugby League World Cup – Although the RLWC has been played since 1954, the modern-day format was not instituted until 1995. While lacking the worldwide profile of the other, much younger Rugby World Cup, it nevertheless draws plenty of interest from punters and sports fans on both sides of the equator. The Kangaroos of Australia have dominated since the early days, winning 10 of a possible 14 titles. The only other nations to have lifted the trophy are Great Britain (1954, 1960, 1972) and New Zealand (2008). Create a betting account – Register with any of our trusted sports bookies in moments via the links in this page. It should only take a minute or so to get your new account up and running. Add some money – Top betting sites accept a variety of fast and convenient deposit methods, including MasterCard, Visa, Neteller, Skrill, PayPal, Paysafecard and direct bank transfers. Claim your sign-up bonus – Most internet bookies offer free bets or cash bonuses to new players. These are great for boosting your bankroll, but be sure to read the terms and conditions before opting in. Place your bets – Now you are signed in and cashed up, so it is time to start punting. Open the ‘Sports’ menu and follow the ‘Rugby League’ link to see all available betting markets, then tap the odds to add a wager to your bet slip. There are hundreds of different ways to bet on rugby league. Below are a handful of the most popular bet types available at leading football bookies. Future bets – It is possible to place bets months, even years out from a market’s eventual conclusion. From the domestic lower leagues to showpiece international tourneys, rugby league futures may cover any number of eventualities. Put money on the outright winner of a division, pick the correct score of a representative series, or back your favourite players to take out top individual honours. Match bets – The exact definition of a match bet or win bet can vary from bookie to bookie. The obvious kind is the straight head-to-head wager on the result of a match, but punters can also bet on which team will reach x-amount of points first, who will lead after x-amount of minutes played, whether or not a team will win both halves, and so on. Handicap bets – When one team is a short-priced favourite to win, match handicaps or line bets tend to offer much better value for money that standard result markets. Bookies set a points line that gives one side a head start and the other an equal disadvantage. For example: if Leeds Rhinos are handicapped at -2.5, they must win by at least three points in order for the bet to pay out. Margin bets – For even greater odds, punters can also choose from a wide variety of markets that combine both the match result and the winning margin. The most common is the ‘big win or little win’ bet, where you must choose between two points spreads for your chosen team (e.g. NSW by 1-12 or NSW by 13+). Other options include points brackets and exact margin bets. Tryscorer bets – Modern sports gamblers love these player prop markets, not least because online bookies often pair them with cash-back bonuses for losing wagers. First tryscorer betting draws big money and offers excellent value for winners, while anytime tryscorer, multiple tryscorer and win/try double bets are also popular. Parlay bets – Better known as accumulators or multi bets in some parts of the world, parlay bets feature two or more single wagers combined on a single ticket. The more bets you include, the better the payout odds, but the risk is far greater because each leg must win in order for a parlay to salute. Many bookie sites offer refunds on rugby league multi bets when only one leg fails.